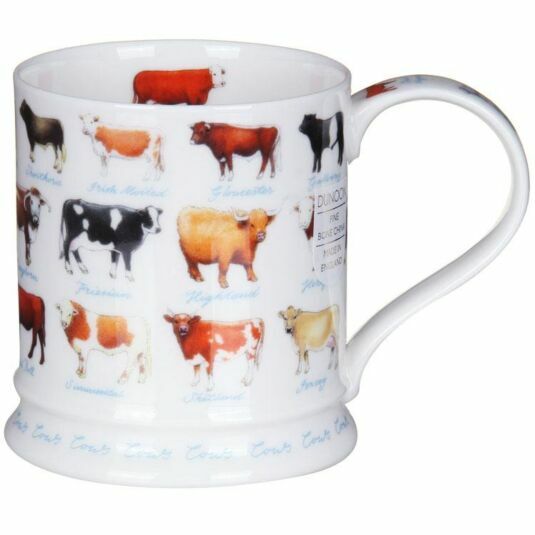 Many of the multitudinous types of cow are featured on this mug from Dunoon, with all their various markings and sizes, illustrated in great detail by Richard Partis with the breed name below. A great gift for all bovine connoisseurs and cattle farming enthusiasts. Richard Partis was born in Somerset in 1964. Growing up in the Wiltshire countryside he developed a great love of the natural world and a desire to be able to paint its beauty in great detail. After gaining an Honours Degree in Graphic Design at Bath Academy of Art he started a long and successful career as a freelance artist and illustrator. Richard has worked for Dunoon for over 20 years painting highly detailed watercolour paintings of birds and animals, landscapes and flowers, tractors and spitfires and many more designs from musical instruments to leaping salmon. His designs feature on mugs in the Bute shape such as the 'classic collection', along with 'Friendly Faces' and 'The Birdlife Collection' in the Wessex shape. Iona is a tankard shaped mug, with a flared base which has a ridge for extra design detail. 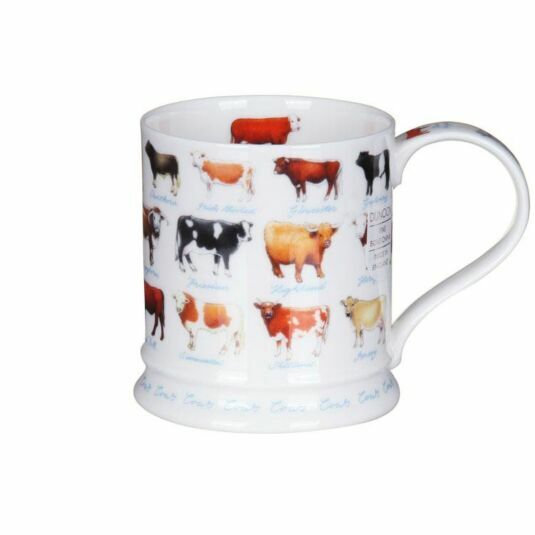 This fine bone china mug holds .4l, about 2/3 of a pint so is ideal for your morning coffee or afternoon tea. The generous handle makes it easy to hold and its friendly proportions will make it a welcome addition to your mug collection.